What's the connection between ancient mythology and modern science fiction? Today we have him back for an interview where he talks about the links between our past and our vision of the future. He also talks about his trips to modern Greece while researching his new book. What link is there between science fiction and mythology? 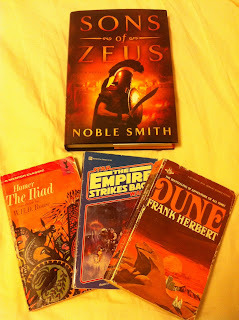 Here's a great example of a direct influence: in Frank Herbert's Dune the hero is named Paul Atreides. That name comes from ancient Greek mythology. The Atreidai were the descendants of a legendary Greek King named Atreus, and his two sons were the main characters from Homer's the Iliad--the brothers Agamemnon and Menelaus. By calling his protagonists the Atreides, Herbert was making a straight correlation to Greek myth. He was letting his readers know that his science fiction story was epic...that it would turn into a sci-fi mythology (which it did). Many have compared Star Wars to a modern mythology, do you think that's accurate? Definitely. Every great science fiction story, in my opinion, is about the hero's journey that Joseph Campbell talked about in his masterful work The Hero with a Thousand Faces. Lucas said that he read Campbell's book when he was writing Star Wars: A New Hope, and that it helped gel everything in his mind about the mythos that he was creating. What's so interesting about Star Wars is that it has permeated our culture to such an extreme that people talk about the characters with the same reverence that ancient Greeks would have mentioned their heroes and monsters. Luke Skywalker is our Theseus, and Darth Vader is the Minotaur that he has to slay in the labyrinth of the Death Star. And Yoda? He's a pygmy-Plato! What's the biggest lesson your trips to Greece taught you about writing? Well, my book Sons of Zeus takes place in a very real place called Plataea. It was here, 2,500 years ago, that this small democratic city-state made a heroic last stand against genocidal invaders. Walking around the ruins of Plataea was staggering. You realize that these people were real. Their story was true. The proof is under your feet--the broken walls and crumbling tombs. That said, a historical fiction writer can't let themselves be hamstrung by the mundane. You have to be able to push the envelope of history to create a story that connects with readers. You need to know all of the facts about how people lived and what really happened. And then you have to give the characters the freedom to live...to let them become legends in the minds of your readers. Learn more about Noble Smith and his writing at noblemasonsmith.com. Follow him on Twitter at https://twitter.com/ShireWisdom. In 431 B.C., Ancient Greece experienced its own “Pearl Harbor”—a treacherous sneak attack that would mark the start of the bloody war between the democracy of Athens and the tyranny of Sparta. Caught between these superpowers, the independent city-state of Plataea became the arena where their battle for control of all of Greece would begin. In Plataea, the young Greek warrior Nikias dreams of glory in the Olympic games as he trains for the pankration—the no-holds-barred ultimate fighting of the era—until an act of violence in defense of his beloved threatens to send him into exile. But before his trial can take place, a traitor opens the city gates to a surprise attack force. Suddenly trapped inside their own fortress, the Plataeans are fighting for their lives. As Nikias seeks to discover the identity of the man who betrayed the city, he makes a daring escape, gathers an army, and leads this ragtag band into a suicidal battle at the gates of the citadel—a battle that will decide the fates of his family, his friends, and the woman he loves. In the vein of Bernard Cornwell, Conn Iggulden, and Steven Pressfield, Sons of Zeus marks the beginning of a richly detailed new action-adventure series. What do you think is the connection between mythology and science fiction? Is Star Wars a modern mythology? I think it's become myth. When writing about historical myths, one has to discover the base truths and then let the characters and situations become larger than life. lol Pygmy Plato. I know that Herbert was inspired by the dunes here in Oregon. True. Mythology and sci fi do go hand in hand. I read The Hero with a Thousand Faces. I can see how story patterns between different media are connected somehow. 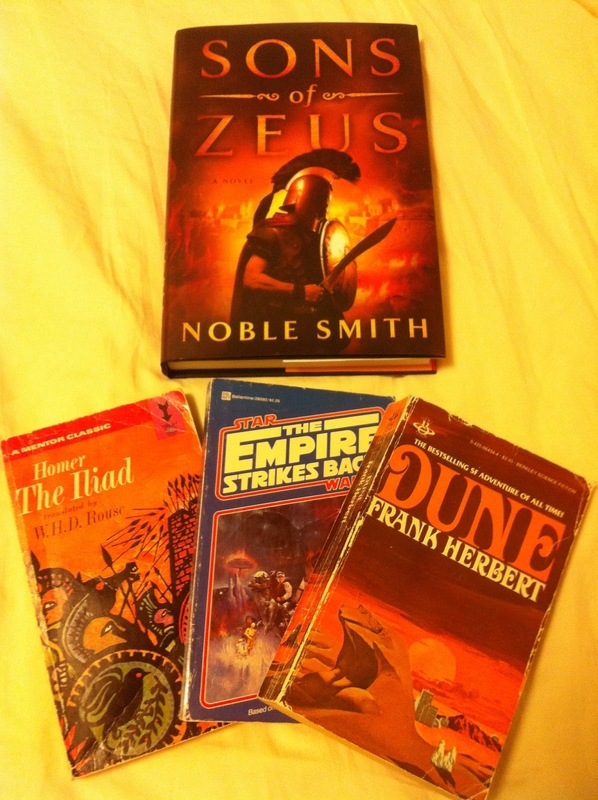 I grew up reading all kinds of mythology...so as I got older, I gravitated to science fiction and fantasy. The connection is pretty darn clear! I remember watching Star Wars and comparing it to King Arthur, for example. I've never read it Medeia. What was your favorite part? I always thought he was inspired by some far off Middle-Eastern country. That's cool Mary! I can't remember, but I did have sticky notes all over it. Yes! This is true. He was doing aerial surveys of Eastern Oregon. I used to live in Oregon too!